Forsythe Middle School sixth grader Arjun Alva didn’t get to relax as much as he would have liked last summer. After all, he had a book to write. Now Arjun has sold more than 700 copies of his self-published book “Adventures of Jimmy Hailbuster” which is available on Kindle and Amazon. His advice to other young writers? Realize it will take a lot of effort, and then make it happen. For Arjun, it all started last spring with a fifth grade writing assignment at Haisley Elementary. 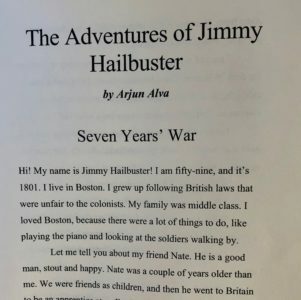 Students were allowed to pick their own subject, and Arjun—a voracious reader and history buff who especially likes to study the early 1700s—chose to write about a young colonist named Jimmy Hailbuster. His teacher, Ralph Carnegie, encouraged him to keep going with the book. He worked on it during the summer and fall, then had it edited and published in December. 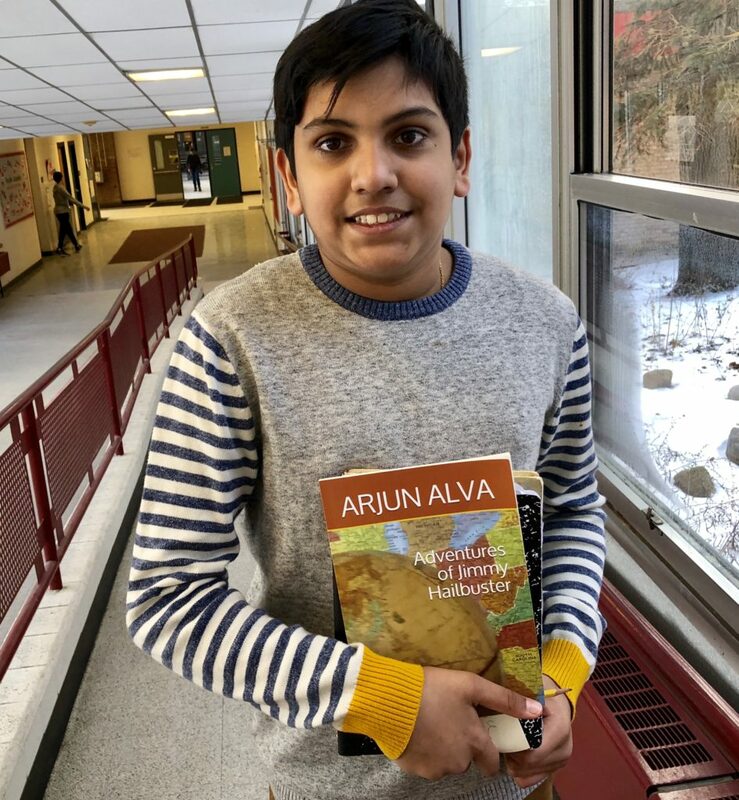 His mother, Lisa Bedbak, says Arjun has a flair for writing and that sometimes when he is time-pressed, he writes on a Google doc on his phone while en route to school. More than anything else, Arjun loves to read, she said, noting that he can talk about science, history, physics, and economics for hours. His all-time favorite subject is math and he does math every day of the week, even during vacations. He also loves Piano and picks up difficult pieces to practice. “My husband and I came to the United States in 2001 as students. Arjun loves going and visiting our relatives in India. He loves learning about India and other countries in general. As a mother, I am extremely proud of him. He works hard and sets a great example for his younger brother, Anmol, who is in 2nd Grade at Haisley Elementary School.” she said, noting that he is polite, kind, and likes to help others. When he grows up, Arjun wants to become a neurosurgeon and a mathematician who writes part-time. “There are many neurosurgeons who are good writers,” he reasons. Arjun is now writing his second book—one full of suspense—and is enjoying the experience. He also plans to one day write a sequel to Jimmy Hailbuster featuring Jimmy’s best friend, Nate—just as his favorite writer, Mark Twain, followed “The Adventures of Tom Sawyer” with the adventures of his best friend, Huckleberry Finn.